Macquarie Capital announce financial closure on the €1 billion Blankenburg Connection PPP project, ahead of speaking at the 17th Benelux Infrastructure Forum. LONDON, ENGLAND, UNITED KINGDOM, October 24, 2018 /EINPresswire.com/ -- Macquarie Capital, Ballast Nedam, and DEME have recently announced that they've reached financial closure on the largest PPP project ever awarded in the Netherlands. The €1 billion Blankenburg Connection PPP project, which involves the construction of an immersed tunnel under the Rotterdam port waterway, a land tunnel and two junctions, aims to improve road links between Rotterdam and its port. Attendees of the 17th Annual Benelux Infrastructure Forum, taking place next month on 21st -22nd November, will have the exclusive opportunity of hearing from Macquarie Capital's Managing Director and Head of Macquarie Capital in the Benelux Region, Willem Stitselaar, who is set to share his experience and expertise at the event. The forum’s latest confirmed attendees also include DEME, part of the Blankenburg Connection PPP project, as well as over 25 international industry-leading organisations set to engage in exciting panels and round table discussions, idea exchanges and debates next month in Amsterdam. Participants will have the chance to be part of an international gathering of financing and infrastructure professionals, as well as take advantage of exclusive networking opportunities and explore the international investment opportunities the rapidly growing Benelux investment market has to offer. As interest and momentum continues to increase in infrastructure projects, it's vital for major players within the Benelux market to keep up to date with the latest developments in the industry and region. 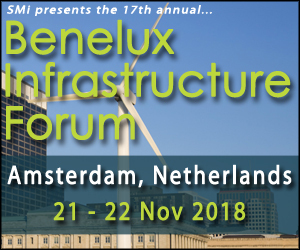 The Benelux Infrastructure Forum will provide attendees with key updates on the latest developments in infrastructure projects, particularly in the renewable energy sector, real life case studies, and new financing mechanisms such as PPP and green bond financing, in order to assist industry-leaders in driving their future success.